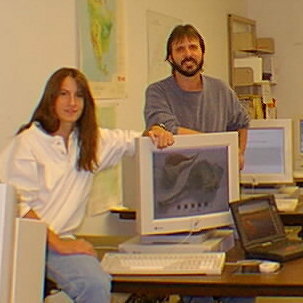 Phil Stoffer and Paula Messina met at Miami University's Geology Field Station near Dubois WY in 1987. Sharing interests in travel, natural history, geographic information technologies and hiking, they have collaborated on many projects since 1989, including the New York Bight Web Site. They both completed degree requirements early in 1998 in CUNY's Earth and Environmental Sciences Ph.D. Program. Return to Geology of the New York Bight Home Page.